Ready to say, "I do!" to Santa Clarita's very best wedding and event vendors? We already have! These are the people we call when we're planning an event to remember of any size. They're the ones we refer when our friends call - and the ones we're proud to call friends. We know you'll love them as much as we do! There's no such thing as "ordinary" when you choose Charmaine's Bouquet Canyon Florist for your wedding and reception. Owner Charmaine has dedicated her life's work to creating floral arrangements and bouquets that are distinctive and a stunning representation of the bride's desires. Arrive to your consultation with a fistful of photos or just a loose idea of what you want. 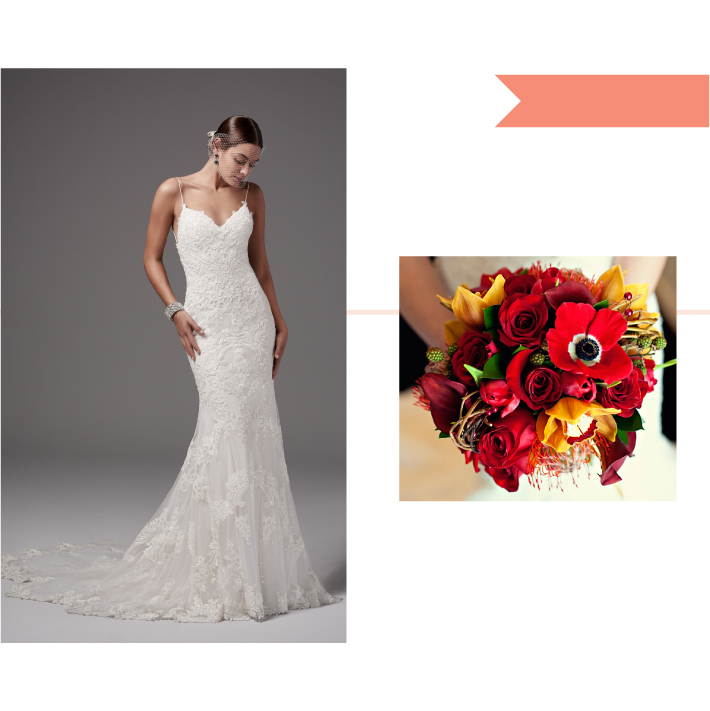 Charmaine will wow you with customized designs using the freshest blooms. Want "rare?" This is the place to go for the extraordinary touches, whether you seek a meaningful bloom or want to incorporate family jewelry into your fragrant buds. Becca Rillo Photography is most known for beautiful, natural lighting and the photographer's "sneak peeks." About 24 to 48 hours after your wedding, you and your guests will get to enjoy a huge "sneak peek" of about 150 images from your Big Day on her website. Because of the limited amount of weddings Becca Rillo takes on each year, her brides are her top priority and receive amazing customer service throughout the entire process. She goes above and beyond to make sure every client has the best day ever - and has beautiful images to cherish forever! AV Party Rentals is Santa Clarita Valley's favorite party and event rental store. With over 44 years of experience, a giant in-store showroom and the largest inventory selection of over 10,000 items to choose from, they can make your dreams come true. AV Party Rentals' capabilities with logistics, flexibility and ability to work well with other vendors allow them to fill the gaps and out-solve any challenges ahead of time. The Design Center is their new in-store "blank canvas" area that was set up so brides and grooms can immerse themselves in the actual wedding-table-setting experience. Build the perfect table setting that fits your colors, textures and linens. Use your wedding centerpiece, color palette or outdoor venue as the inspiration, then set up the actual chairs, linens - and more - to see exactly how your seating will look before you walk down the aisle. 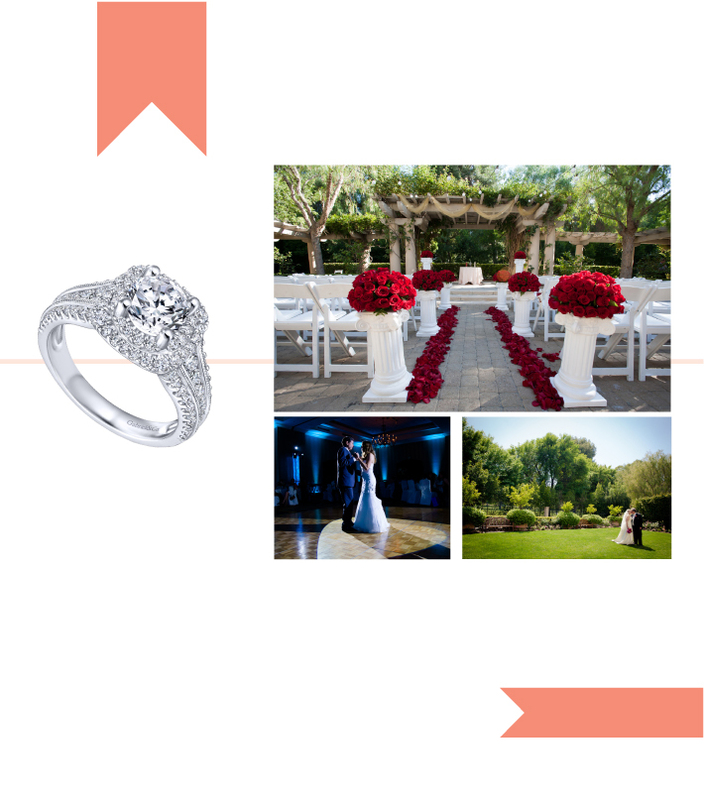 All you need to do is call to schedule your free wedding-planning consultation! Manage both your makeup look and your 'do at Blo-Out Lounge, where excellence in hair and makeup combine for the most beautiful "you." Really want to make an impeccable impression? Work with the Blo team to get the most gorgeous extensions; they offer the finest you'll find anywhere and their stylists have been specially trained to make yours look natural, full and luscious. Brides receive 20 percent off any extensions when you mention Inside SCV; Blo offers many styles and top-quality brands. (Call for details.). Ensure consistency among your bridal party with Blo; the company's brimming with specially-trained stylists who can accommodate your whole wedding party all at once, from Grandma to the Flower Girl and everyone in between. 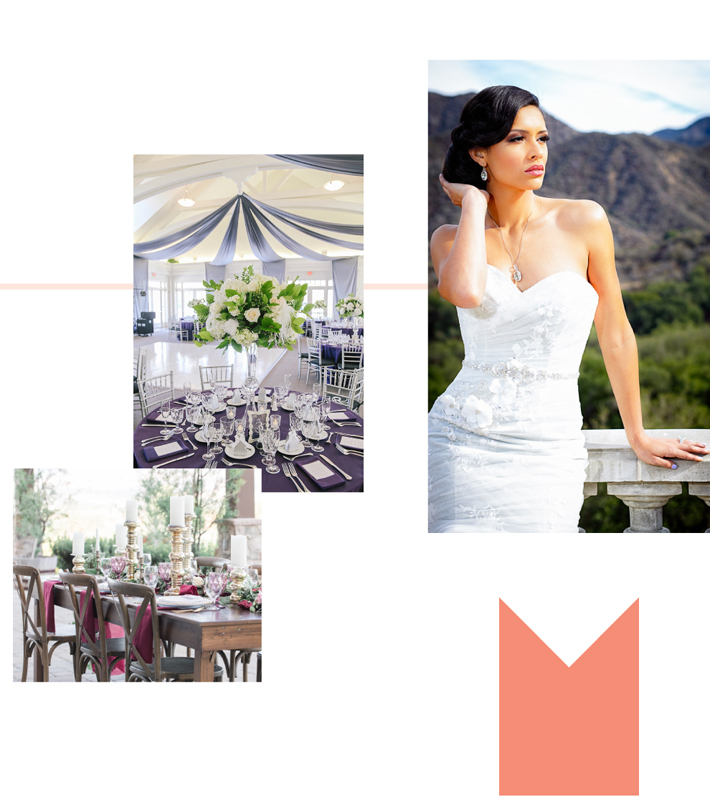 Priscilla's Bridal, Santa Clarita's premier bridal services vendor, is nestled in the brand's expansive full-service salons, offering every guest a peaceful and welcoming experience alongside superior service and customer care. Their talented team is dedicated to continually expanding their knowledge, skill and expertise in order to offer you the highest-quality services and treatments available, all designed to send you off looking and feeling your absolute best on the most important day of your life. Priscilla's has two Valencia locations for your convenience. Valencia Country Club has been providing exceptional service to its members and guests for over 50 years. 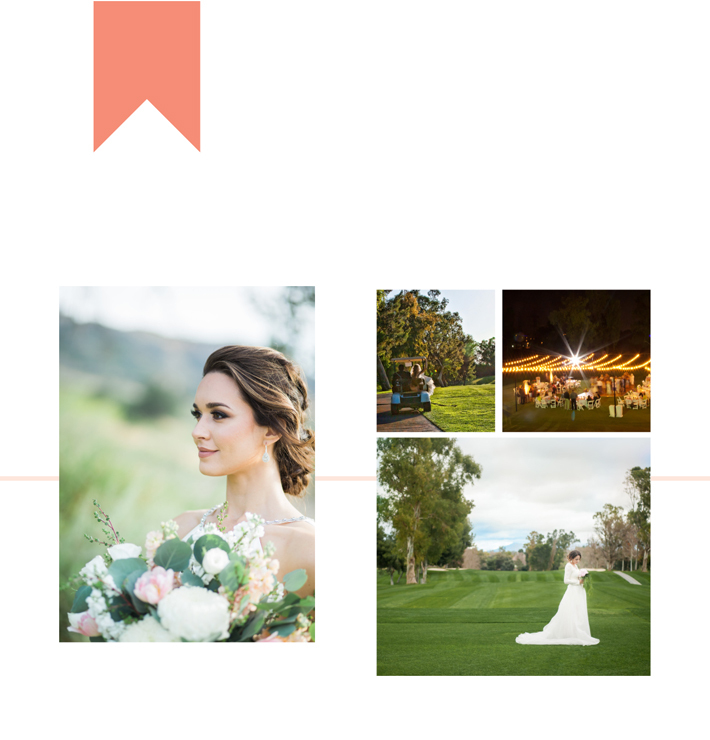 The past two years, they have really stepped up their Private Events Department and have become one of the most popular wedding venues in Santa Clarita. Their Outdoor Event Pavilion and delicious food is what really sets them apart from others - but their stunning grounds, traditionally-appointed ballrooms and luxurious additions will wow you, too. Talk to Tiffany Grummer, director of special events, for details. You don't need "model measurements" to look like one on your wedding day thanks to Cruz's Bridal. Their team of experts will wow you during your personalized bridal-figure style consult. Find the love of your life - the dress version! - in a cut that will fit fabulously with only minimal alterations. 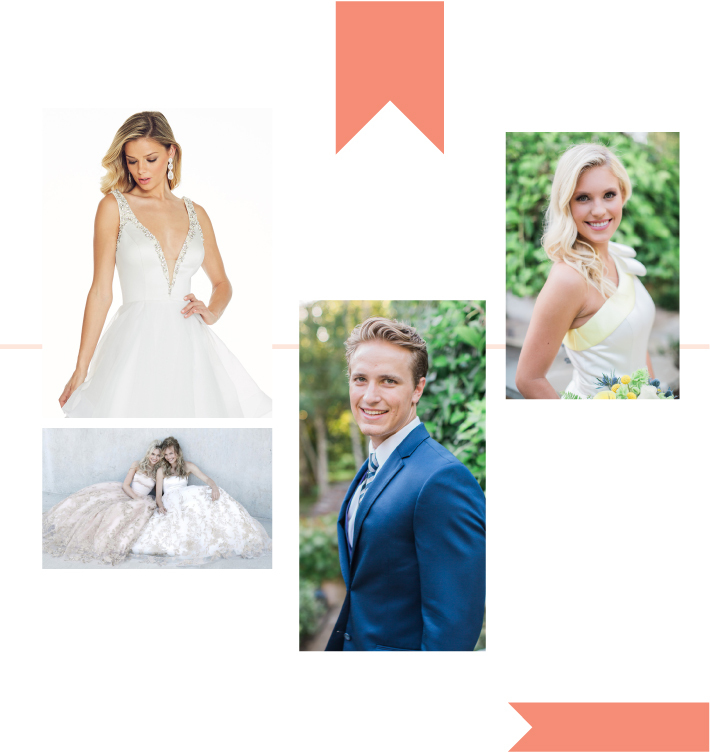 Cruz's carries Maggie Sottero, Sottero & Midgley, Allure Romance, Bill Levkoff, Allure Bridesmaid, Wilderly Bride (This new collection is bo-ho style!) and many more to guarantee an extraordinary selection. During your appointment you'll discuss your venue, culture and more so that your dress is the ultimate expression of you. They'll even teach your bridesmaids how to dress you and fix your bustle - or do it for you on the big day. They supervise all wedding-gown alterations, too, to ensure perfection. Make your appointment today. Bloomies Florist has been serving the Santa Clarita Valley for over 29 years. 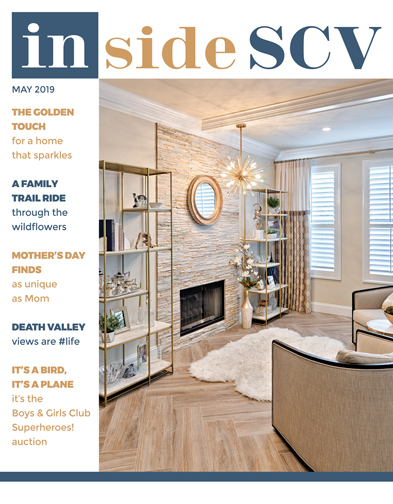 For nearly three decades, they have seen couples' desires change and styles come and go but they have always stayed current with the latest trends - while setting a few of their own! Bloomies specializes in all things floral, offering wedding planning and florals for weddings and events of all shapes and sizes. Bloomies is the winner of Best Floral Arrangement in "Best Of" Santa Clarita in 2016 and 2017 - and owner Henriette Norris would like to thank the Santa Clarita Valley for their patronage over the last 29 years. They strive to provide beautiful, quality arrangements at a good value and hope to do so well into the future. Visit them soon - and give Henriette and her team the opportunity to make a magical memory for you! At Classic Designs Jewelry, they strive to provide the best for you and your loved ones with an emphasis on customer satisfaction. They regularly travel to Antwerp, Belgium - the diamond capital of the world - to bring back the best diamonds and allow you to truly show your affection for the one you love. At Classic Designs, they have two master goldsmiths on the premises with over 50 years of experience. They are committed to quality workmanship, the fine art of craftsmanship and excellence in custom design, as you can see here in their Henrietta double-halo diamond engagement ring with different metal and shape options. Hyatt Regency Valencia is a romantic destination featuring beautiful gardens and elegant ballrooms. Nestled in the heart of Santa Clarita, couples say, "I do" at Hyatt Regency Valencia to experience an award-winning culinary team and staff with first-class service. Hyatt includes a complimentary stay on your wedding night and even lets you earn points towards a honeymoon at Hyatt Hotels worldwide. Visit today to experience their floor-to-ceiling remodel! Outside-the-box creativity is what clients have come to expect from Acton Creative Flowers. Here, the tablescape's rich florals show off the designer's skill; this bride gave the florist total designer freedom while matching the bride's colors, wowing guests and the couple alike. 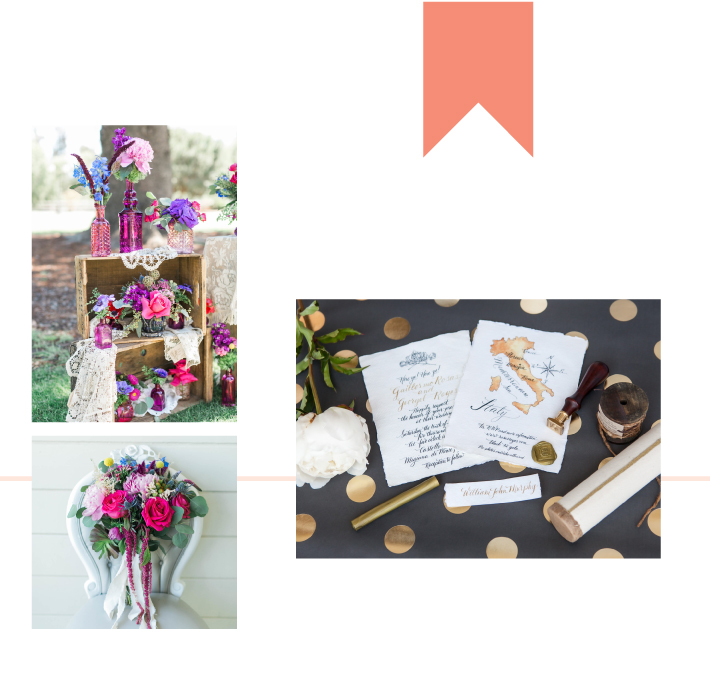 By Invitation Only (BIO) is your local purveyor of specialty wedding invitations and party favors. This family business is big on relationship building and has dedicated over 20 years in the industry - making couples' dreams come true! "I woke up like this!" That's what you'll be saying to all your friends and family. The only thing you'll get ready for every morning are the daily compliments by coworkers and people passing by on how amazing you look. Lashmaster and microblade artist Mary Elizabeth specializes in sensitive-skin clients, extension retention, artistry and "on-point brows." Mary Elizabeth will help you choose from a vast variety of different styles and shapes for the most flattering fit for your face. Imagine waking up beautiful every morning, feeling confident and gorgeous for your entire honeymoon and after. Text for your appointment. The luxurious TPC Clubhouse emulates old-California ranch style architecture, featuring interiors of distressed alder wood trim, vaulted ceilings, stacked stone accents and panoramic oak-studded views of the Santa Clarita Valley and surrounding championship golf course. Offering four banquet venues, the TPC Valencia features versatile accommodations for hosting indoor and outdoor events for as many as 200 guests. Since 1991, Celebrate has gained numerous awards and recognition from the community, as well as regional and national press, for their one-of-a-kind creations. Expect individually-tailored service and results that leave your guests in awe. 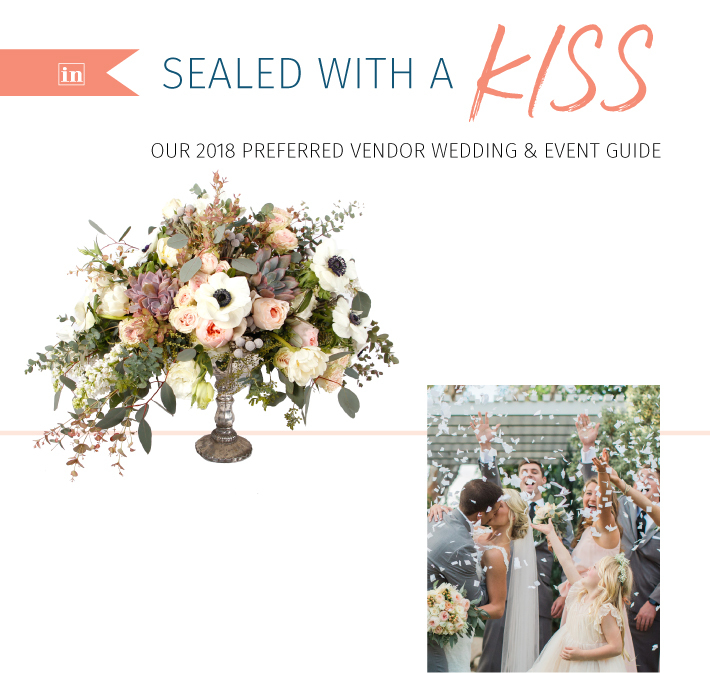 Premium florals and "above and beyond" treatment are standard fare for this chic wedding vendor, which also offers the very best in custom and ready-made invitations. Experts in groundbreaking, luxurious, high-fashion designs, Celebrate is where to go when you want Pinterest-worthy picturesque perfection. The famous Newhall Ice Co. does it all! Let it "snow" on your wedding day with a blanket of the real, fluffy white stuff at your Winter Wonderland reception, plan on a wowing ice sculpture "ice bar," or order ice for pick up or delivery. Emergency services are also available 24 hours a day, seven days a week, too, if your event doesn't go as planned! Your relationship is anything but ho-hum... so why should your wedding or reception venue be any different? If you're looking for hip, hipster, hippie or... really, anything in between - Wolfcreek Brewery is the spot you never considered - which is why it's so amazing. Nestle your guests in the relaxed vibe of the space while you turn every inch of their indoor/outdoor venue into your own. Extremely reasonable pricing gets even better when you partner with their sister restaurant, Wolf Creek, for catering. They'll really work with you to make this an event your guests will talk about for years - for all the right reasons. Fairest Of Them All is a makeup artist and hair stylist company that specializes in enhancing your natural beauty for your wedding day or other special event. They have over 18 years experience in weddings and special events and take a special, personal interest in their clientele. They want to make sure that your special day is a memorable one - and that you look and feel your absolute best. On the day of your event, they travel to you and stay with you for as long as necessary. They can accommodate any size party and can keep you on schedule. Many of their clients start off as brides; they are proud to say that they continue on as clients throughout their journeys for baby showers, baby photos, family photos and other joyous occasions! 24/7 Events has been known for high-quality product and superior customer service since 2006. They truly aim to exceed the expectations of their clients and they do so by treating each event as their own. 24/7 has a wide product portfolio that offers more than just rentals. They can provide transportation, entertainment and event production for your next event. They have on-site wedding consultants that can sit down with you and discuss your wedding and provide expert advice related to rentals and design. They take great interest in each event they assist with. The moment you come through the door, you are treated as a friend, not just as a customer. At WAX by Heather Nelson, their only hair removal method is waxing. Their primary goal is your happiness and satisfaction - it's all about you. Believing that positive well-being comes from within, Owner Heather Nelson strives to provide an experience that is unique and results in clients looking and feeling spectacular. Using professional techniques and personal attention, Heather helps clients achieve their best looks without fearing a "cookie cutter" design; considering esthetics and working with each person's personality, Heather helps them create a look that's individual and attractive, ensuring that they are comfortable in their own skin. She loves her work and her clients and it shows. Whether you're walking down the aisle or strutting across the red carpet, the tulle + dye shoppe has the gowns and the expertise to make your day extra special. They carry exquisite, internationally-known designer gowns, cocktail and party dresses for all ages and occasions as well as shoes, jewelry and accessories to make your look complete. Having traveled the globe with the Miss Universe Organization and Ford Models' Supermodel of the World program, Owner Jane Bebita has styled some of the world's most exotic, accomplished women. She's there to help you find your dream dress, too! If you don't see it, they'll create it! Grooms want to look good, too! The Tuxedo Revue carries most of their inventory on the premises, which gives the groom the opportunity to try on different styles to see what looks great on him - and what will complement the bride's dress the best. Your team of stylists will then help coordinate the rest of your wedding party so that everyone feels incredible on your wedding day. The Tuxedo Revue pros can even do last-minute alterations and assist with late rentals, too. They're the best in the business with over 2,500 weddings and half a million tux rentals in their long history. Wedding hair, don't care! Toss trends and be you; wedding hair and makeup should make a statement about your style and personality. Garrett Markenson Coiffure's collection of innovative designers aren't bound to bridal "blah" - they're ready to make a jawdropping impact on your big day. Each is dedicated to cultivating a high-fashion look that perfectly coordinates with your dress, venue and desires. At Salt Creek Grille Catering and Events, Tamra and her team make every detail easy and stress free. Keep these points in mind when meeting with potential caterers to minimize stress and maximize your experience. Know your budget; your catering team can make nearly any dollar amount work, but in order for them to best cultivate a sample menu that fits your desires, they need to know a very close approximation of how much you really want to spend. Keep a list of your priorities. 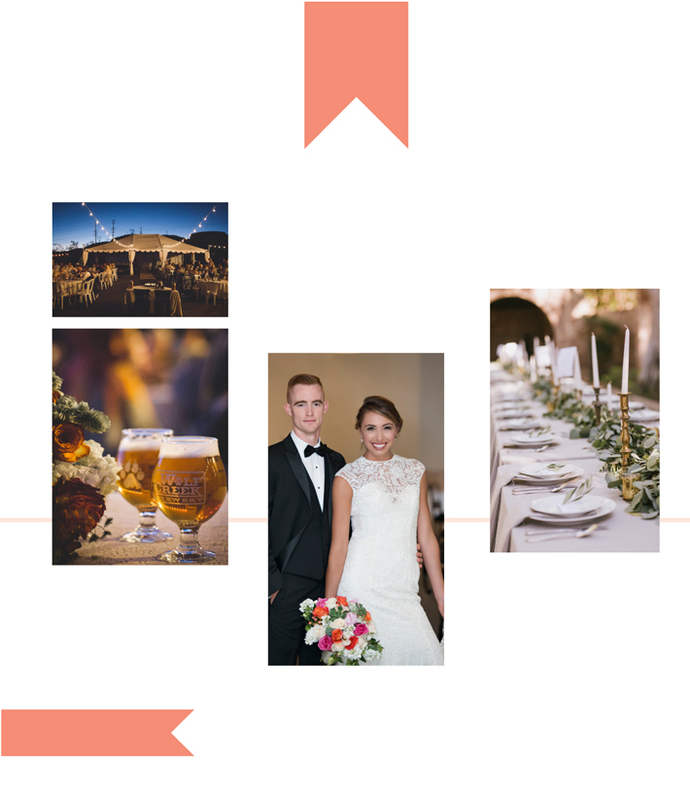 Salt Creek Grille Catering and Events has created a Wedding Questionnaire to assist you in your planning. It's free - just ask for it! If there's a time gap between the ceremony and reception, let your Salt Creek Catering team know. With creative planning, they can get the party started early. Don't set a predictable table; explore new ideas for both the guest tables and buffets. Don't settle for pre-determined menus every other couple is also reviewing. 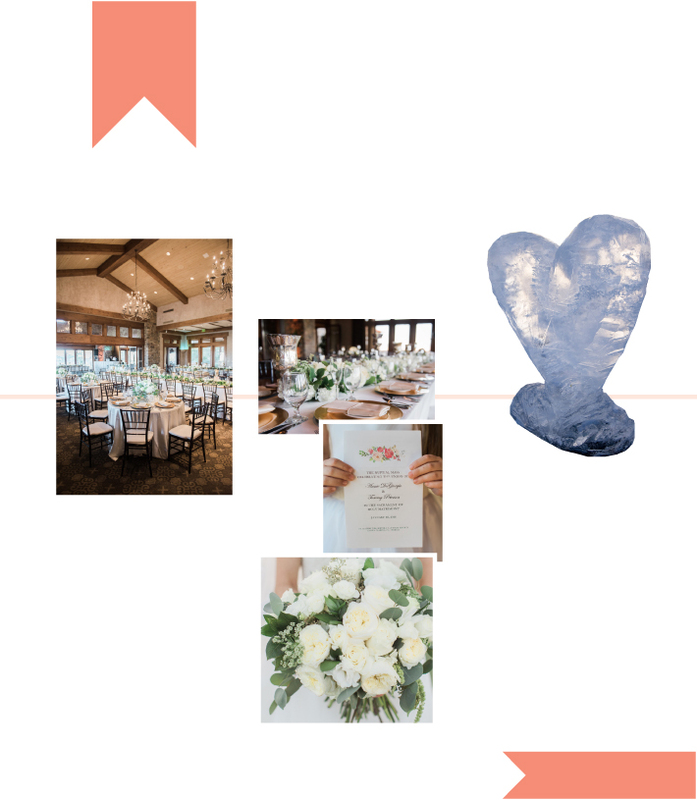 Salt Creek Grille Catering customizes and personalizes the menu for your wedding using ingredients based on locality and seasonal availability, incorporating the newest trends, themes, ingredients and display design. Be ready for your caterer to accommodate special diets - many people now have dairy, gluten and other restrictions. Work with a caterer who can adapt on a whim! Streamline by using caterers who are also event coordinators. Salt Creek Grille Catering can help you arrange every last detail, especially the day of, so that you can enjoy your special day.